Taylor's 300 Series has introduced countless players to the pleasures of the all-solid-wood acoustic experience; it's the entry point to Taylor's USA-made instrument line. Players who step up to a 300 Series instrument will be rewarded with a guitar-for-a-lifetime that will only sound better with age. It doesn't take but a few strums to learn how the mix of tone woods, construction and appointments combine to make Taylor's famous playability, intonation and tone. The 300 Series has everything you need and nothing you don't need in a fantastic sounding and playing instrument. 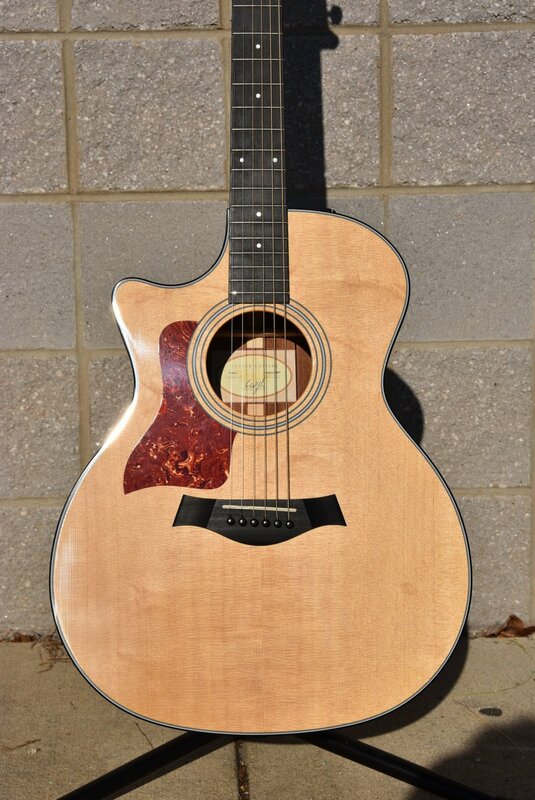 All 300 Series instruments ship in a deluxe hard shell case made by Taylor for optimal fit and protection. Together with Taylor’s custom-designed “professional audio”-grade preamp, this system produces exceptional amplified tone and responsiveness. On stage through a PA, plugged into your favorite acoustic amplifier, or direct into recording software, the Expression System 1 faithfully conveys the voice of your Taylor guitar. The Taylor Expression System 1 operates through a proprietary 9-volt battery compartment and easy-to-use volume, bass and treble controls.